"I'm in the garden Cushion" is a coloured cross-stitch chart (very easy to follow) with instructions translated in English. 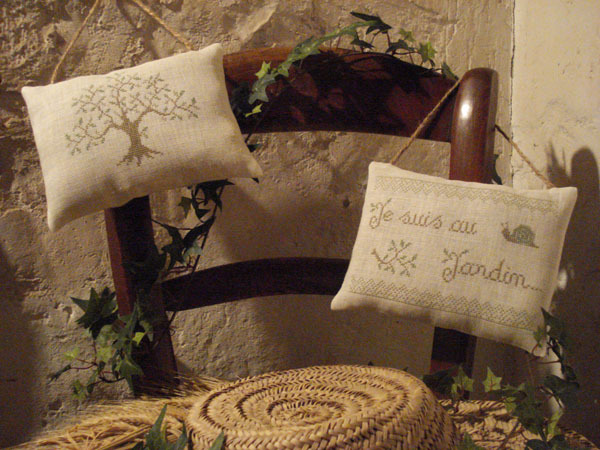 This is a 2 part design mounted into a small hanging cushion. The text says "I'm in the garden". You can easily adapt the text in English and mount your finished work differently as shown in the second picture. This pattern shows 3 colours (DMC references on the chart). The model on the picture has been stitched on a 32 count linen fabric (colour "Ecru") using two strands of cotton over two threads of fabric. Recommended Fabric: of your choice regarding the type (linen / evenweave / Aida) and the stitch count (colour "Ecru" or "off-white"), dimensions 20x30 cm (8x12 in) if you want to follow the designer"s instructions to transform your work into a cushion or signpost.